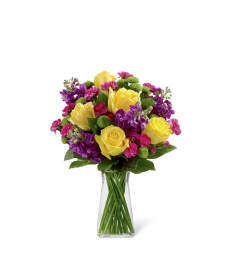 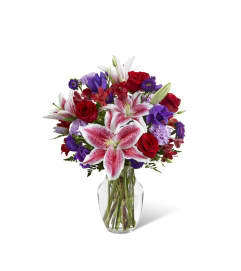 The FTD® Radiant Blooms™ Bouquet blossoms with sweet appreciation and gratitude to delight your special recipient. 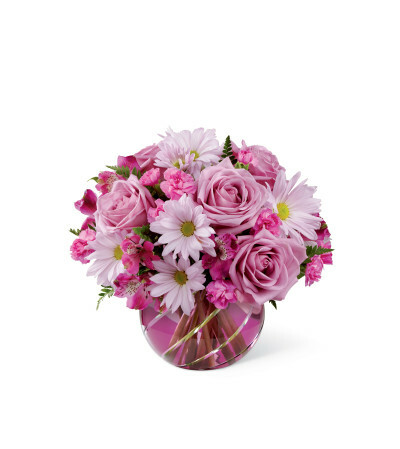 Lovely lavender roses, purple Peruvian lilies, fuchsia mini carnations, lavender traditional daisies and lush greens are brought together to create an inspiring flower arrangement. Presented in an exquisite purple bubble bowl vase with a cut glass design, this mixed flower bouquet will make an incredible Mother's Day, birthday, or thank you gift.